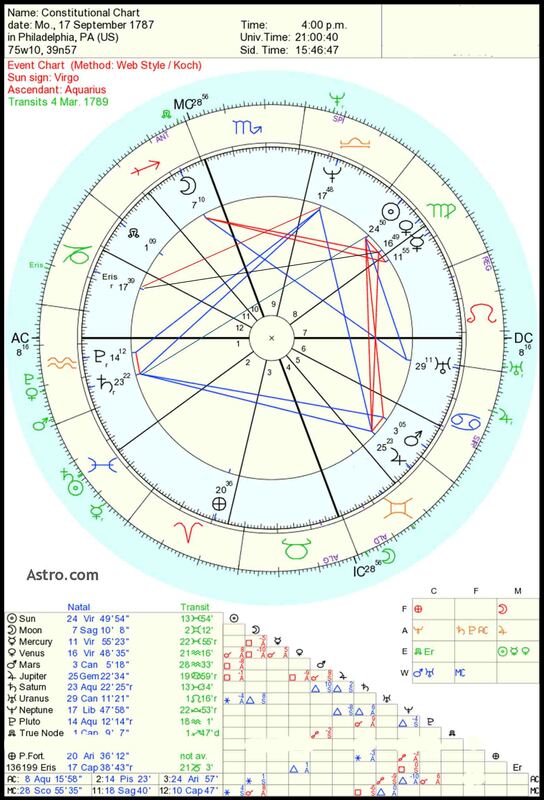 In this book, the horoscope of George Washington, his entire life and history, is evaluated, judged and analyzed through the discipline of astrology. In examining all those who participated in the Founding of America, Washington was its single most important player. He took command of and built an army that would ultimately drive the British out of the colonies. At that time the British owned the most powerful army in the world, and it often looked like they would crush the Americans. Yet in crisis after crisis he kept that army together, a task no one else could have achieved. He assisted, especially as President of the Constitutional Convention, in founding a republic that has lasted will over two centuries. Then under the laws of the new Constitution, he served as president of this republic, and firmly cemented its new laws into place. While he saved everything he wrote from childhood on, and while these writings are the foundation of much good scholarship, there are many important questions that remain unanswered. What was his father like? His father died when Washington was ten years old. Scholarship does not tell us much, though some historians speculate that their relationship was distant. 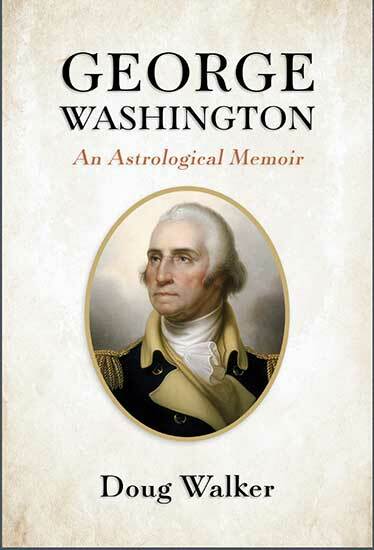 Washington’s astrology implies that he had a close and nurturing relationship with his father. Some historians imply that since Washington never had training in a formal university, like Jefferson or Adams or Hamilton, he was really not all that effective in thinking through issues, and that in order to get his decisions right, he had to rely on those brilliant subordinates who really did all the work. This is untrue. 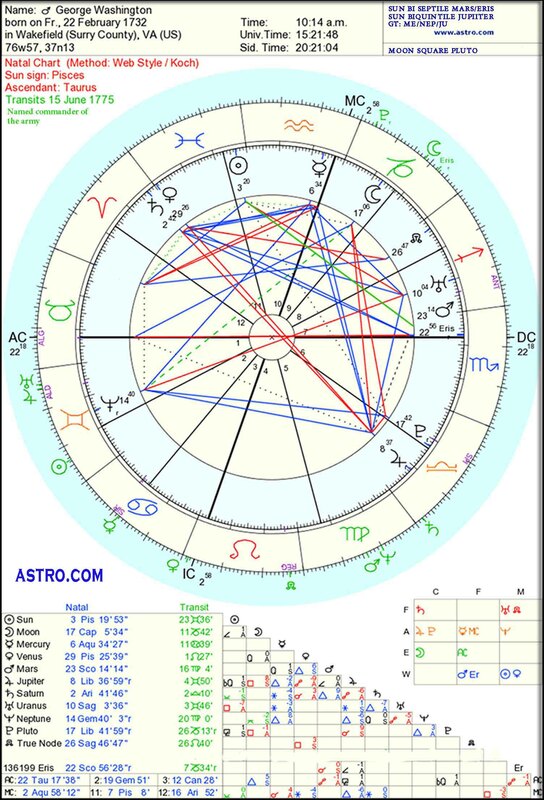 Washington’s Grand Trine in air signs, and involving the planets Mercury and Jupiter, gave him an illumination of mind. When he quickly had to decide in matters of war, the Grand Trine conferred on him a total understanding of the issues at hand, and most of his decisions were the right ones. When he chaired the Constitutional Convention, he understood every argument made, and that constitution, still in effect, is now the oldest written constitution in the world. When he served as president, he acted with deftness of decision and swiftness of execution, and he made his presidency perhaps the best and most effective that has ever occurred so far (2018). His profound intuitions guided him into choosing the most capable sub-ordinates. Alexander Hamilton was one of his associates, and I discuss in a brief biography of Hamilton the possibility that they had worked together in past lives. Hamilton helped him build a centuries-long economic foundation to America. Washington did not always choose the right person for the right job—witness Benedict Arnold—but he chose enough to make him one of the greatest figures in history. Astrological arguments, delineating his gifts, are offered all through this book. George Washington’s chart. Click for larger. History takes place in the framework of stellar influence. A synodic cycle composed of Pluto and Neptune marks the rise and fall of civilizations. A shorter synodic cycle, that of Jupiter/Saturn, one that takes twenty years, marked the American Revolution, which lasted from 1763 to 1783, from when the King of England and his assistants began to interfere in the running of the colonies, to when the Treaty of Paris was signed between England and its former colonies, the new USA. The progress of that synod can trace the evolution of the Revolution. For example, when the Boston tea party took place in Boston in Dec. 1773, Jupiter and Saturn were pretty much in opposition, and the revolution was beginning to flame into a hot war. Charts of the founding of any new nation, whether of the Soviet Union in November 1917, or of the founding of modern England (Dec. 25, 1066, noon in London), will be valid for as long as that government lasts. The two most important charts of the USA Founding are the Declaration Chart (July 4, 1776, Philadelphia, 5:30 pm, from Sibly) and the Constitutional Chart (September 17, 1787 Philadelphia, 4:00 pm, from Madison’s diaries). The Declaration chart features a Rx Mercury. 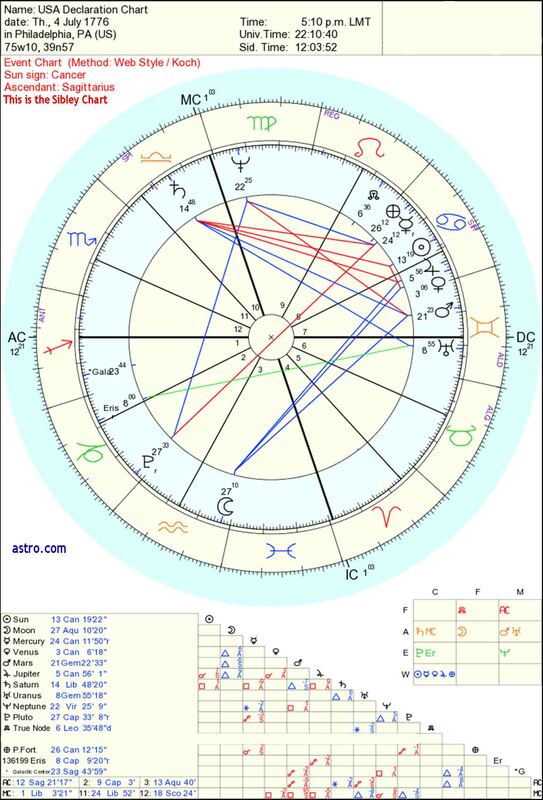 In an event chart Retro Mercury implies a looking inward; in this case, it was argued as a treatise on the philosophical application of eternal laws, or first principles, that apply in all times to all humankind. The Declaration discourses on laws like the right to life, liberty and justice, all of which derive from a Higher Power. In part, the Declaration chart describes the spiritual meaning of the Founding. It is as powerful as is the 1066 chart for England. Both charts are as powerful now as when they were formed. The Constitutional chart features a synodic conjunction of Pluto and Saturn. This synod describes how political power is handled in America, how it is controlled, and how it occasionally will destroy elites when it is misused. Thus fell the Federalist Party, an later, on America’s 3rd Saturn Return, the Planter slave-owning aristocracy. Both of these charts are as influential now as they were in Washington’s day. So I discuss them in detail. Also, certain Saturn transits to the Declaration chart are notable, and they can at times, like during the American Civil War, bring about crises. This book describes first their influence and then how they Were dealt with by Washington and others. Washington had a special relationship with Saturn. Since his life purpose was so focused, his Saturn cycles were also precise and exact. This book delineates all the important ones that affect his life, like the death of his father, his marriage, his assumption of command of the army, his election to the presidency, etc. In historical astrology, cycles rule all. This book is available for purchase as an epub or kindle on Amazon. For that, go here.